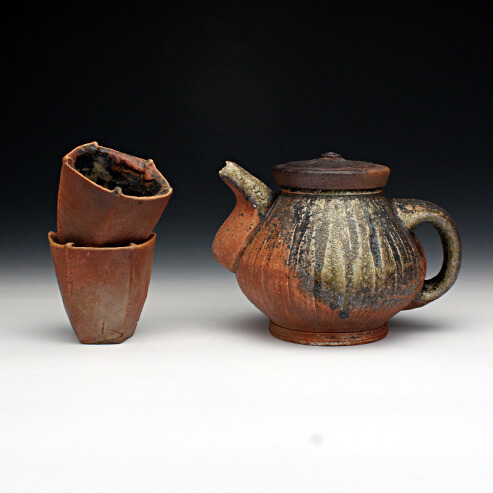 Jason Hess teaches ceramics in the School of Art. As a ceramic artist and avid wood fire practitioner his research has focused on the alchemy of this process for the past 17 years. His artwork has been featured in over 125 exhibitions worldwide and he has participated in artist residencies at The Archie Bray Foundation and Red Lodge Clay Center, in Montana, and The Pottery Workshop, in Jingdezhen China. Jason Has an MFA from Utah State University. A desire to have objects that fulfill specific purposes inspires me to make functional pots. The infinite and elusive variety of texture and color attainable through the various making and firing processes that I use has generated an interest in presentation. I enjoy presenting my work so that a viewer might notice and appreciate subtle differences in form and surface. By grouping similar forms of differing size and color I hope to compose a visually dynamic display, which invites the viewer to enjoy the tactile nature of each individual piece and how they relate to one another.